Isabelle is a bright, bubbly young woman who has cerebral palsy which has resulted in the right hand side of her body weaker than her left. Isabelle has a talent and a passion for making beautiful mosaic pots which she sells at the local markets and dreams of one day setting up her own business marketing her designer pottery. By using a rotating lazy susan sitting on top of her work table, Isabelle had been able to pursue her passion, not without some challenges though. The lazy susan rotated too easily and there was no height adjustment to allow Isabelle to easily access the top or bottom of the pot when applying the mosaics. Isabelle’s mum, Di, approached Isabelle’s Occupational Therapist who referred her to the TAD Hunter Group and volunteer, Peter Cork. After lots of questions and discussion Peter used CAD software to design a rotating table for Isabelle to try. It was no simple task for Peter. Isabelle uses a powered wheelchair so there could be nothing under the work table to impede her wheelchair. The rotating table had to have some friction to hold the pot in the required position but not so tight that Isabelle could not rotate it herself. As well, the rotating table had to have a non-slip surface and a pin to go through the drain hole in the centre of the pot, so when the elevating table was on an angle, the pot could not slide off the rotating table. Finally, the table had to be able to change height to cover the size of most pots used and allow Isabelle clear vision, especially from above. Isabelle and Di couldn’t be happier with the solution that Peter designed and built. It took several visits and a trial run to sort out the specifications and make sure that Isabelle could manage the table. By Di’s own admission, Isabelle had soldiered on as best she could with original lazy susan as she is quite determined. However with the new set up her output has increased and the standard of the finish on the pots is even higher. 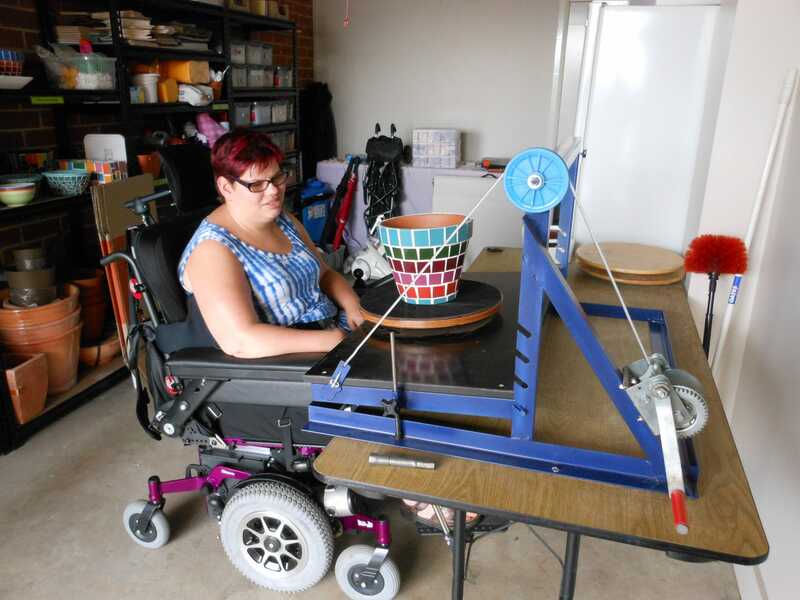 “Being able to raise and lower the pots and to view them from different angles has made all the difference,” says Isabelle. Mum, Di, is delighted at the changes she can see in Isabelle. “Issie is so much more confident and loves being more independent,” says Di. The greatest reward has been the praise from Isabelle’s customers. Di says, “The look on her face when they tell her how beautiful the pots are.” Priceless!